This is a Chinese name; the family name is Ge. Oil portrait of Mao Zedong at Tiananmen Gate painted by Ge Xiaoguang. Painting dimensions: 600 × 460cm (h × w). Ge Xiaoguang (Chinese: 葛 小 光; born 1953 in Beijing), is a Chinese artist best known for painting the massive 6 x 4.6-meter portrait of Mao Zedong that hangs at Tiananmen Gate in Tiananmen Square. Ge Xiaoguang graduated from the Fine Arts Department of Capital Normal University, and in 1971, was employed by Beijing Fine Arts Company (renamed Beijing Gehua Cultural Development Group in 1997) where he began to study large-scale portrait painting from Wang Guodong (Chinese: 王 国 栋). In 1971, Ge Xiaoguang also became responsible for painting gigantic portraits of Sun Yat-sen, Karl Marx, Vladimir Lenin and Joseph Stalin for display in Tiananmen Square. 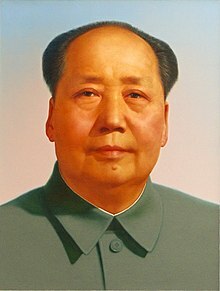 In 1976, the year of Mao Zedong's death, Wang Guodong retired and Ge Xiaoguang took his place in 1977 as the author of Mao's portrait at Tiananmen Gate, which must be re-painted and re-hung yearly due to the effects of weather and air pollution. It is a job that Ge Xiaoguang continues to this day in a studio located near Tiananmen Square. He is also an artist of landscape paintings. ^ Qian Yanfeng (17 September 2009). "Painter for the People". China Daily. Retrieved 12 December 2009. ^ "歌华：争做世界一流文化供应商". Sina.com. 9 April 2009. Retrieved 12 December 2009. ^ Ching-Ching Ni (14 September 2006). "Mao is Their Canvas". Los Angeles Times. Retrieved 12 December 2009. ^ Kong Hui. "Painting by Ladder and Crane". Chinese Business World. Archived from the original on 8 July 2011. Retrieved 12 December 2009.